Jonah doesn’t want the people of Nineveh to repent from their sins so he decided to run away from the Lord. 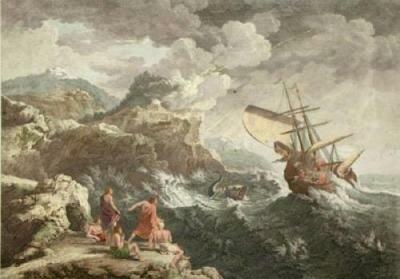 Jonah went to the sea harbor at Joppa and bought a ship ticket to Spain. Then Jonah went aboard the ship and was on his way to Spain. God was not happy that Jonah did not obey His command to go to Nineveh so He blew a strong wind against the ship. The storm was so severe that the sailors on the ship started praying to their gods. They also throw the cargos on their ship into the sea so that the ship will be lighter. Jonah was not aware of the bad storm because he fell asleep below the ship deck. The sailors finally decide to cast lots to ask their gods who had caused all these bad storms. They cast the lots and the lot fell on Jonah. So the sailors throw Jonah into the sea and a giant fish came and swallowed Jonah. Jonah stayed in the giant fish for three days. While Jonah was inside the giant fish, he prayed to God and asked Him to forgive his disobedience. God listened to Jonah’s prayer and forgave Jonah. Then, God commanded the giant fish to spit Jonah out of its mouth. The giant fish obeyed God and spat Jonah out onto the shore. Jonah obeyed God this time. He went to Nineveh and warned the people that if they do not repent from their sins, God will destroy Nineveh in 40 days. Everyone who heard Jonah’s message became sad. They fasted and wore sackcloth to show their sorrow. The King of Nineveh also heard Jonah’s message and dressed himself in sackcloth. Then he sent his officials to send out an order for everyone that everyone including the people and their animals must fast and wear sackcloth; that they must all pray to God to forgive their sins so that God will have mercy on them and not destroy Nineveh. The people of Nineveh stop doing sinful things and so God forgave them and never destroy Nineveh. Jonah was disappointed that the people of Nineveh repented from their sins so that God never destroy Nineveh. Jonah hated the Nineveh because Nineveh is an enemy to Israel. Jonah left the city and built a shelter for himself to protect against the sun. God made a vine plant to grow up to protect Jonah from the sun. Jonah was very happy that he had a vine as a shelter but God sent worms to eat the vine plant. The vine plant became scorched and Jonah felt faint because the sun was beating on him. I think that Jonah was greedy. Like God said he cared more of himself then others.